Balekayi Palya. When we visit our parents, one of the first things that get planned (even before we reach their place) is the food! My father takes the lead, asking us for our preference before he goes out to buy vegetables. Considering my mother's fairly vast repertoire of lip-smacking traditional cuisine, not so easy to decide! Also considering my three siblings, their spouses, plus our kids, there are too many palates to please when we all gather. This time around, the popular vote for the meal was for balekayi palya, saaru (rasam), huli (sambar) and rice, the star being the palya. Balekayi in Kannada is raw plantain and I have fond memories of eating different types of palya made by my mother. Part of the umm... charm was squabbling over the slightly charred bits of the stir-fry. We would so look forward to the meal, eat some palya with plain steamed rice, some with rasam and then finally some with curd rice. Simple meals are often the most satisfying, especially with the mother hovering around, serving generously! This is not a dish you could make in a hurry as peeling the plantains and grating them can be a bit messy. The grated plantain is mixed with some rawa, wheat flour, spices, oil and salt. Then fried in a generous amount of oil until cooked and crisp. Well worth the effort of course! I did not have my standard measuring cups, measured using another cup set which looked a bit suspiciously un-standard to me! Please take this as a rough estimate, remembering that more of wheat flour will make the palya sticky, whereas a bit more oil won't hurt :) Be generous with the spices and you will have a winner! Method : The plantains need to be raw, green and very firm. If you do buy them ahead, keep them immersed in water as it prevents them from ripening. Oil your hands, peel and grate the plantains using a fairly large holed grated. A thin holed one may make the palya mushy. Mix together the wheat flour, bansi rawa, salt, chilli powder, 2 tbsp oil, hing and salt. Mix this lightly but thoroughly into the grated plantains. Heat the remaining oil in a heavy bottomed wide pan. Add the mustard, let it sputter. Then the chana dal, urad dal, hing and turmeric. Once the dals turn golden brown, add the plantain mixture. Mix well, cover and cook on low heat. Do not add any water. 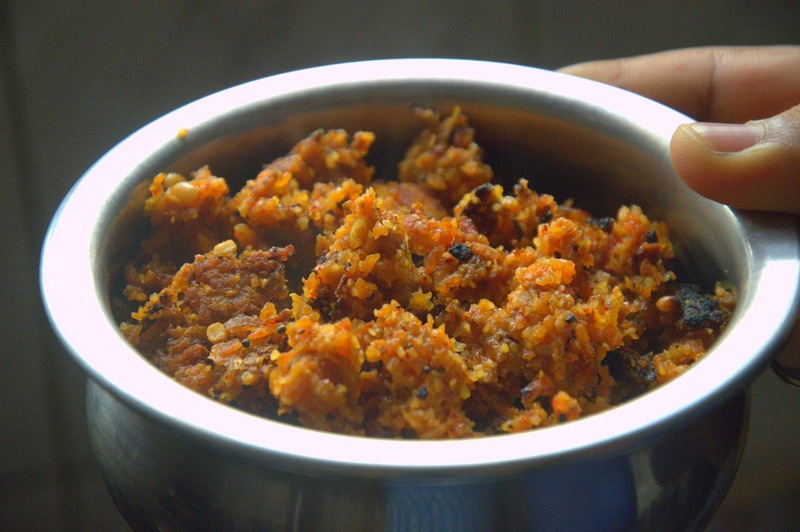 Cook till done and crisp, mixing gently 2-3 times in between, making sure you scrape out the palya from the bottom. Take care not to over mix or the palya will be mushy. Turn off the heat, keep covered for a few minutes. 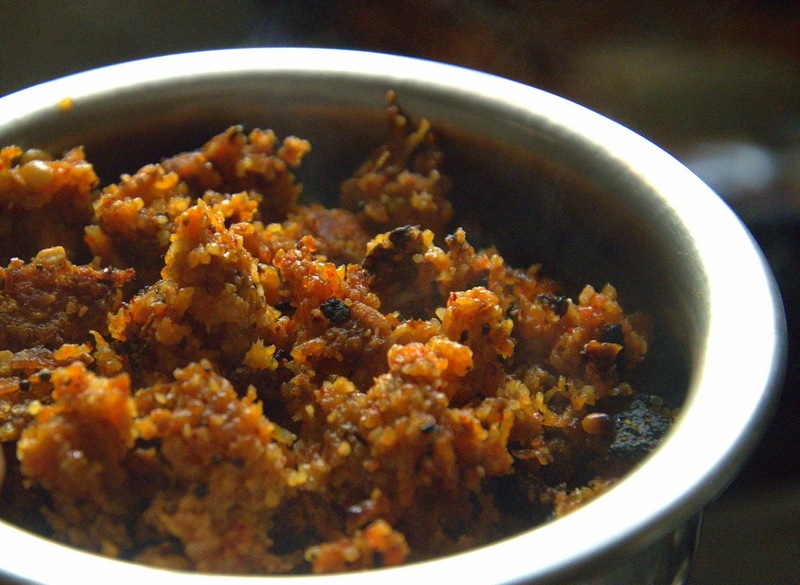 Serve hot with steamed rice and rasam. In case you thought I am experimenting with the camera, of course not! It is just me trying to manage a couple of pictures in the chaos with the hungry clan waiting for their meal!